It may be the size and the shape, but the iPad is becoming quickly well known for its photo display options. It may be nice to pass around to friends and family, but that is not what iPad photo sharing is really about in the long term. Instead, ways of making these photos go mobile and accessible from other points through the iPad's social networking, internet, and new broadcasting functions are really what are going to cement its place in the new world of mass pictures. Here is a look into the various ways that people can share photos from the iPad, using a variety of methods to get them to a larger audience beyond the touch screen. It may seem archaic at this point, but one of the primary ways that photos are shared on the iPad is through email. This functions in similar way across all iOS platforms, and is a tool that is built into the Photos app. Once in the Photos app you have to begin by selecting the photo or album that you want to share. Go to the upper right hand corner and select the button that has a curved arrow leaving a box. 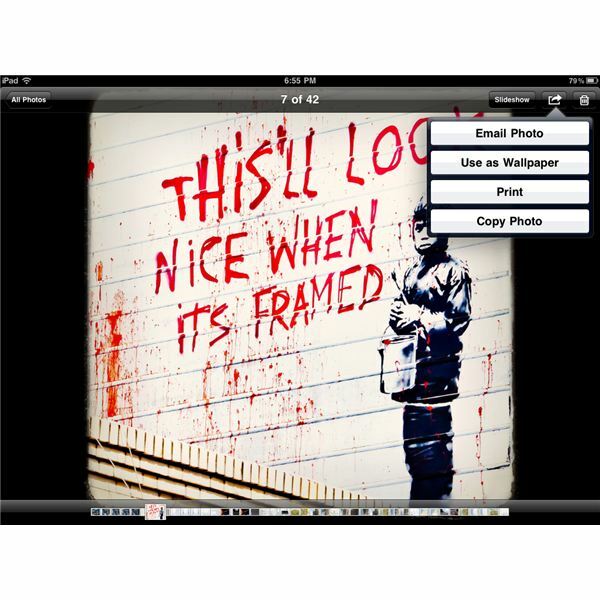 This will give you options to email the photo, or do things like applying it as wallpaper or printing it. 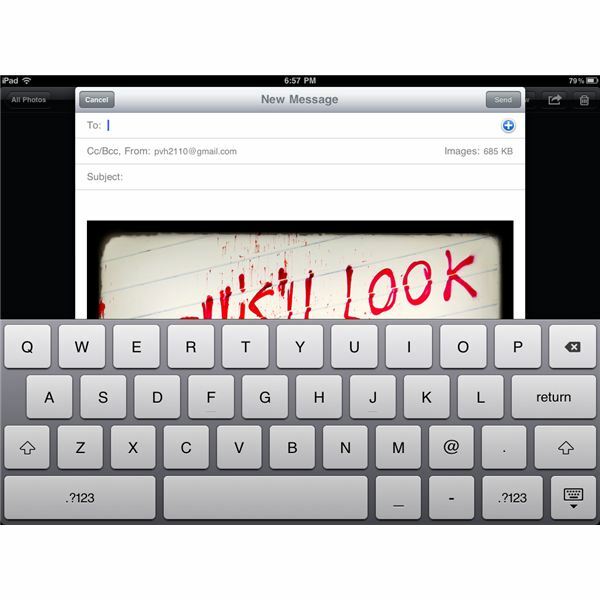 When you select Email Photo an email prompt will come up in the email account that you have already applied to the iPad through Mail. Here the photo will be attached and will appear in the body of the email, and you just need to apply the recipient address and the subject. From here you can just choose Send and it will be sent off as if it was a standard email being sent from your iPad. 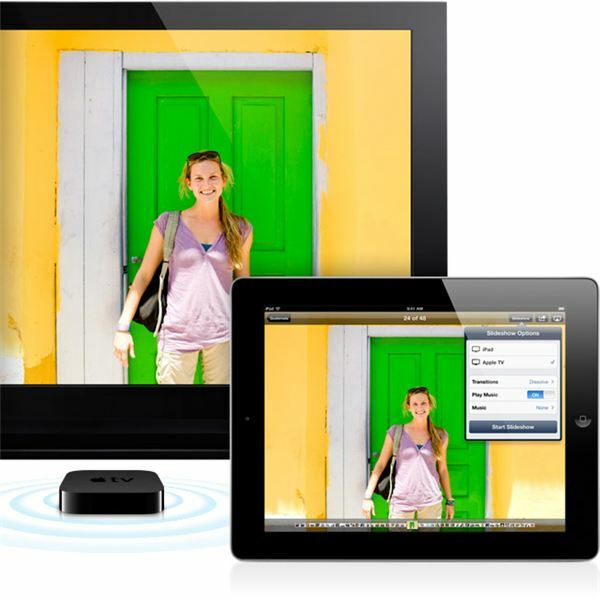 The primary way that Apple has portrayed the iPad's photo sharing is through the new Airplay feature, which is also for other iOS devices and is not exclusive photos. The basic concept behind the iPad’s Airplay is that media and content are broadcast and then received by an external device, such as a television. This is not a practical thing for all iPad users, as Airplay has to be used with an Airplay ready receiving device, such as Apple TV. This also requires your iPad to have at least the iOS 4.2 update or above, which is where the software was first introduced. The iPad’s Airplay function is different than other iOS tools, as it does not have its own app or even its own direct button from the Home screen. Instead, it is just an element of the tools that use it, which would be things like Photos or iPod. When you get into Photos you will not seen an Airplay option at first, but instead you will be given it when you actually choose a photo or album. The top right will then give you the Airplay button, which looks like rectangle with a solid triangle in the middle. When you choose it you will have a couple options based on what is available, yet if a proper receiver is not available then you will not be able to utilize it. From here your photo, or photo slideshow, will then stream to the external device once that device is configured to properly receive it. 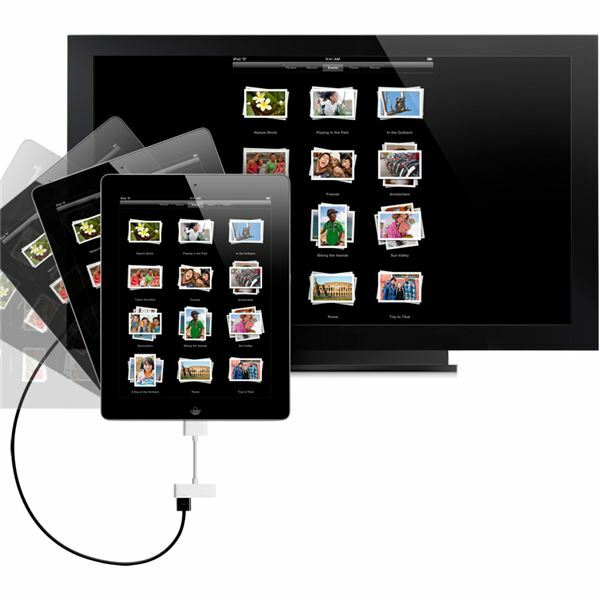 Digital AV Adapter, a peripheral you can purchase, that allows you to then connect your iPad to your HDTV at full resolution. This allows you to essentially work with your iPad through the large display of the television, allowing it to expand to the reaches that your new screen is already at. This allows for photo sharing in the same way that it works on the iPad itself, simply by browsing through the photos and utilizes slideshows. These slideshows can then be viewed by a mass audience through the television without having to employ and Airplay connection. The future of iPad photo sharing is not even around the tools that are in play now, but with iCloud when it comes along with the full version of the iOS 5. iCloud, as a cloud storage service, will allow you remote storage spaces where you can upload your content and then access from all of your iOS devices. Within the iPad’s iCloud you will have a service primarily for photos, called Photo Stream. The basic premise of Photo Stream will be that when you take a photo it immediately goes to iCloud and becomes available on all iOS devices, which means that photo storage is inherently remote. This means that the process of sharing photos with your iPad will become one step faster and will remain mobile right from the start.